A major rescue effort was launched in the Ross Sea in early January when the 51 metre Korean fishing vessel Jeong Woo 2 caught fire. It was the second major incident in Antarctic waters in as many months and involved several Korean fishing vessels, a United States research vessel and a United States Air Force (USAF) aircraft. Jeong Woo 2’s distress call was picked up by another Korean fishing vessel, Hong Jin 707. The information was relayed via the New Zealand vessel Antarctic Chieftain to the Rescue Coordination Centre New Zealand (RCCNZ) at about 3am on 11 January 2012. At the time, Jeong Woo 2 was about 3,700 kilometres south-east of New Zealand and 600 kilometres north of McMurdo Station, with a crew of Korean, Vietnamese, Russian and Chinese seamen. The vessel reported that a fire was burning out of control on board and only one viable lifeboat remained. Of the 40 crew, 25 were believed to be in a lifeboat, with 12 on board the vessel and three missing. Three of the crew still on board were reported to be seriously injured. “Five vessels responded to the distress call, including the sister ship Jeong Woo 3, which was about 35 minutes away,” says RCCNZ search and rescue coordinator Dave Wilson. The US research vessel Nathaniel B Palmer, with hospital facilities on board, was about 12 hours away. 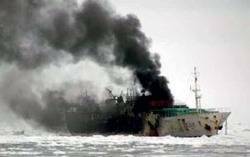 When it left Jeong Woo 2, Nathaniel B Palmer reported that the vessel was still afloat but burning fiercely. Jeong Woo 3 was unable to tow the vessel’s remains to a position north of 60 degrees south for disposal as planned, and the vessel is believed to have sunk. RCCNZ and MNZ have no involvement in determining the causes of the fire, which will be a matter for Korean maritime authorities.